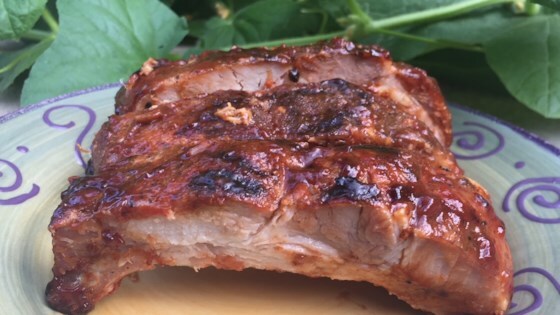 "These Instant Pot® ribs fall right off the bone and are ready in just 30 minutes! In this family of seven I had zero complaints and these sweet and spicy ribs, that's a win for me!" Mix brown sugar, chili powder, parsley, salt, garlic powder, black pepper, cumin, onion powder, and paprika in a bowl using a fork, breaking up any large clumps. Rub spice mixture over both sides of the ribs. Place a steam rack inside a multi-functional pressure cooker (such as Instant Pot(R)). Pour water and cider vinegar into the bottom of the pot. Lower ribs into the pot by curving them around the edge. Close and lock the lid. Select high pressure according to manufacturer's instructions; set timer for 25 minutes. Allow 10 to 15 minutes for pressure to build. Release pressure carefully using the quick-release method according to manufacturer's instructions, about 5 minutes. Unlock and remove lid. Set oven rack about 6 inches from the heat source and preheat the oven's broiler. Line a baking sheet with aluminum foil; place ribs on the foil. Top with barbeque sauce. Broil ribs until sauce is bubbling, about 3 minutes. These baby back ribs are rubbed with Italian sausage seasonings. Any small- to medium-sized racks of ribs will work. Nutrition data for this recipe includes the full amount of barbeque sauce. The actual amount of barbeque sauce consumed will vary. Really easy and delicious recipe. But I think we could have just gone with the rub and it would have been just as much. I don't think the additional bbq sauce is needed. My family loved these. They were super tender and flavorful. I have the 6 qt so I could only fit 1 rack at a time. I will make these again.